← Welcome to Meg Cabot Week! Face Value: Well…there’s a whole lot of bright pink on this cover, and not a small amount of sparkle. I’ll give you that. BUT – there’s something kind of great about it. First, I love that there’s no photograph, so we get to imagine Mia however we want. Second, there’s something so extreme about the pink and the sparkle and the princess-y nature of this cover that I can’t help but feel about it the same way that Mia feels about becoming a princess. At first glance, it’s horrifyingly over the top, but as you get used to the idea, there’s something totally appealing about it. Does it Break the Slate: Oh my goodness, yes. Mia remains my favorite of the Cabot heroines that I’ve read. She’s loud and impulsive and awkward, deeply loyal and incredibly passionate. She handles her transformation from awkward teen into somewhat-less-awkward Princess of Genovia with hilarity and style. Plus, I love the way she embraces both traditionally girly and not-so-girly elements throughout the whole story. To sum it up in short – when she compiles a list for her grandmother of “The Ten Women I Admire Most in the Whole World” she includes both Madonna and Hillary Rodham Clinton, as well as“The Lady Cop I Once Saw give a truck driver a ticket for honking at a woman who was crossing the street.” I like to think that in Mia’s reign as Princess she has had the change to meet both Madonna and Secretary Clinton and works actively to stop guys from believing it is their god given right to catcall any woman who happens to be walking down the street in a skirt. Who would we give it to? Well I think that most people who aren’t me have already read it by now. But I would happily hand it over to anyone who wants a genuine, relatable protagonist with their princess culture. Or maybe I’d just try to give it to a teenager to give them a sense of what communication was like back in the days of dial up internet. Review: Thanks to the 2001 Julie Andrews / Anne Hathaway film (more on that later this week), The Princess Diaries is probably the most recognizable Meg Cabot title, even to people outside of the YA community. Luckily, this recognizability is rooted in a pretty terrific story, one that Cabot unfolds with humor and humility. For Mia Thermopolis, the shock of discovering she is, in fact, the Princess of Genovia is no more unsettling than the utter indignity of her mother dating her algebra teacher. And Mia isn’t even passing algebra. If you don’t know this plotline already, Mia has to go through princess lessons with her grandmother so that she can be transformed into someone who can properly rule and won’t humiliate the country at a state dinner. It would be easy for Mia to be this blank slate kind of a character, the type of vaguely defined “normal girl” whose role as the story’s protagonist is to be neutral enough so that the readers can allegedly imagine themselves as her, no matter who they are. That the point of the story is “ordinary girl becomes royalty – it could be you” just like “ordinary girl has two hot boys who love her so much they want to kill her in sparkles and shirtlessnes” is the point of a certain other story. But instead, Mia is this funny, likable weirdo (trust me, I mean this as a huge compliment), that you read about because you like her, and you want to know what happens to her. She also defines herself very strongly as an activist – when she first finds out that she’s a Princess she explains to her father that she can’t move to Genovia because “what’s best for me is to stay right here and finish high school…and then I’m going to join Greenpeace and help save the whales.” And then, the only way her dad convinces her to sit through the agony of princess lessons with her grandmother is by donating $100 PER DAY to Greenpeace. This is awesome, not only because it’s great to have a protagonist who is socially conscious and actively minded, but because it is really great to have a potential world leader who is socially conscious and actively minded. I have the utmost confidence in Mia’s ability to make Genovia a real force in the world for environmental change. Um, I mean, I would if Genovia were a real country. Of course. “Oh, no, I now have fingernails. I am not kidding. For the first time in my life, I have fingernails. They’re completely fake, but I have them. And it looks like I’ll have them for awhile: I already tried to pull one off and it HURT. What kind of secret astronaut glue did that manicurist use, anyway? You might be wondering why, if I didn’t want to have all my hair cut off and fake fingernails glued over my real, stumpy fingernails, I let them do all that. I’m sort of wondering that myself. I mean, I know I have a fear of confrontation. So it wasn’t like I was going to throw down my glass of lemonade and say, “Okay, stop making a fuss over me, right now!” I mean they gave me lemonade! Can you imagine that? At the International House of Hair, which is where my mom and I usually go, they sure don’t give you lemonade, but it does only cost $9.99 for a cut and blow dry. I love, not only how hilarious this description is, but the way it acknowledges the mixed feelings Mia has about her transformation. She maintains her humor, her feminism and her environmentalism, but she still takes a certain pleasure in getting a really nice haircut, and being told she looks nice when makeup accents her cheekbones. I love that Meg Cabot lets Mia like all of this, without devaluing her uncertainty about the whole princess business. Brianna’s going to talk more about this on Friday when she describes our viewing of the film version, but I just want to mention that the Grandmere of the books is no Julie Andrews. This woman is terrifying, and kind of mean, and not a small amount crazy. She smokes and drinks a lot, has tattooed on eye-makeup and refuses to acknowledge Mia’s actual last name, Thermopolis because, her mother kept and gave Mia her maiden name. Also, Mia’s Dad being in her life and alive adds a lot to the story. This relationship is nice to see develop, and I wish we could have seen this in the movie. And of course, this is a romance, so I would be remiss if I didn’t touch on that aspect of this book at least briefly. Here, once again, we have the predictably satisfying dichotomy of “total jerk who his hot” and “long time friend who is terrific and is also hot!” And yet, it totally works. Because one of the things I loved about this book is that there’s no big reveal where Mia realizes that Michael has been attractive all along. She’s always had a crush on him, but didn’t want to say anything because it’s weird because he’s her best friend’s older brother. And Josh Richter is totally that guy, the one you refer to by his full name when you remember him as an adult because you never really new him but fixated on his hotness for a long time. So of course Mia wants to go out with him when he asks her to go to the Cultural Diversity Dance (I also love this detail, btw). And of course he turns out to be a total loser who’s only dating her for her fame and publicity. And of course it’s really exciting for Mia and for all of us readers, when she finally ends up kissing Michael. It’s believable and totally fantasy all at the same time. I have a lot of complicated feelings about princess culture in our contemporary society, and a lot of those feelings are negative. But the fact of the matter is, it is deeply embedded into our cultural fabric, and it is a very real part of the way little girls define their identity as they grow up. And if all this princess-worship is going to be out there, I have to say, I feel pretty awesome about the fact that Mia Thermopolis is there for girls as a role model. 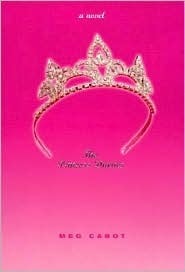 This entry was posted in Reviews, Theme Week, Young Adult and tagged Activism, Meg Cabot, Pink, Princess Culture, Romance, Young Adult. Bookmark the permalink.